FILE - An image grab taken from a video from AFPTV, on Feb. 6, 2019, shows forces loyal to Libyan strongman Khalifa Haftar patrolling in downtown Sebha, the biggest city in southern Libya. 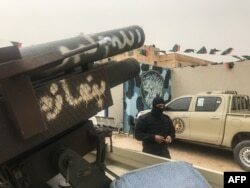 Fighting erupted Friday around the Libyan capital, Tripoli, shortly after the departure of the U.N. secretary-general, who had been in the country for nearly three days and called for a de-escalation. "I leave Libya with a deep concern and a heavy heart," Antonio Guterres said as he left Benghazi. "I still hope it will be possible to avoid a bloody confrontation in and around Tripoli." Forces under the command of Gen. Khalifa Haftar, who holds sway in the country's east, have moved toward the capital, which is controlled by the U.N.-backed Presidential Council and Prime Minister Fayez al-Sarraj. If they enter Tripoli, they could be confronted by militias protecting the city. The U.N. chief said the organization is committed to finding a political solution for the country. 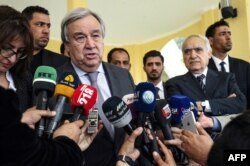 "Libyans deserve peace, security, prosperity and the respect of their human rights," Guterres said. In New York, the U.N. Security Council met late Friday afternoon at Britain's request, for a private briefing from Guterres' top man in Libya, Ghassan Salamé, who accompanied Guterres to his meetings in Tripoli, Tobruk and Benghazi. United Nations Secretary-General Antonio Guterres, left, speaks to the press before departing from Benina International Airport in Libya's eastern city of Benghazi, April 5, 2019. After listening to Salamé via a videoconference from Libya, the often-divided Security Council issued a united appeal to Haftar's forces to halt their advance. "The members of the Security Council expressed their deep concern at the military activity near Tripoli which risks Libyan stability and prospects for U.N. mediation and a comprehensive political solution to the crisis," said the council president for April, German Ambassador Christoph Heusgen. "They called on LNA forces [Haftar's Libyan National Army] to halt all military movements. They also called on all forces to de-escalate and halt military activity." Heusgen reiterated that there can be no military solution to the conflict, and that the council intends to "hold those responsible for further conflict accountable." Council diplomats said Haftar did not appear to be backing down, despite having met under U.N. auspices at the end of February with Sarraj in Abu Dhabi and agreeing to hold general elections. 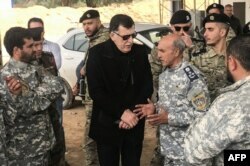 The head of Libya's U.N.-backed unity government, Fayez al-Sarraj, center, visits military and security commanders of the government forces who supervised recapture of the checkpoint 27 in Janzour, between Tripoli and the coastal town of Zawiya, April 5, 2019. Haftar has received support from Egypt, the United Arab Emirates and Russia in the past, but Moscow joined the call for restraint on Friday. The United States joined France, Italy, the United Arab Emirates and Britain on Thursday to strongly oppose any military action and to call on all parties "to immediately de-escalate tensions, which are hindering prospects for U.N. political mediation." In a joint statement, the five countries warned, "At this sensitive moment in Libya's transition, military posturing and threats of unilateral action only risk propelling Libya back toward chaos." A local militiaman, belonging to a group opposed to Libyan strongman Khalifa Haftar, stands next to vehicles the group said they seized from Haftar's forces in the coastal town of Zawiya, west of Tripoli, April 5, 2019. The potential for a battle over control of the capital could spark another cycle of violence in the country, which has been mired in civil war since the violent ouster of dictator Moammar Gadhafi in 2011. It could also scuttle plans for a U.N.-facilitated national conference due to start on April 14 that aims to lay out the path to new elections.